The Bird-X Balcony Guard Ultrasonic Bird Chaser utilizes ultrasonic sound waves to efficiently and effectively frighten, annoy and control pigeons, other birds and bats within a 900 sq. ft. range. A weatherproof exterior helps this repeller last for reliable outdoor use. Provides effective and safe bird control with silent signals, ideal for porches, decks, patios, balconies or any area. Motion sensor included. AC cord included. Electronic Bird Deterrent helps control birds outdoors with sophisticated sonic technology. Natural predator sounds and bird distress cries frighten birds away. Features adjustable volume control, bird sounds and day/night/24 hour operation modes for effective bird control. Use for pigeons, starlings, sparrows, seagulls and most common pest birds. Weatherproof construction. AC cord included. Covers up to one acre. 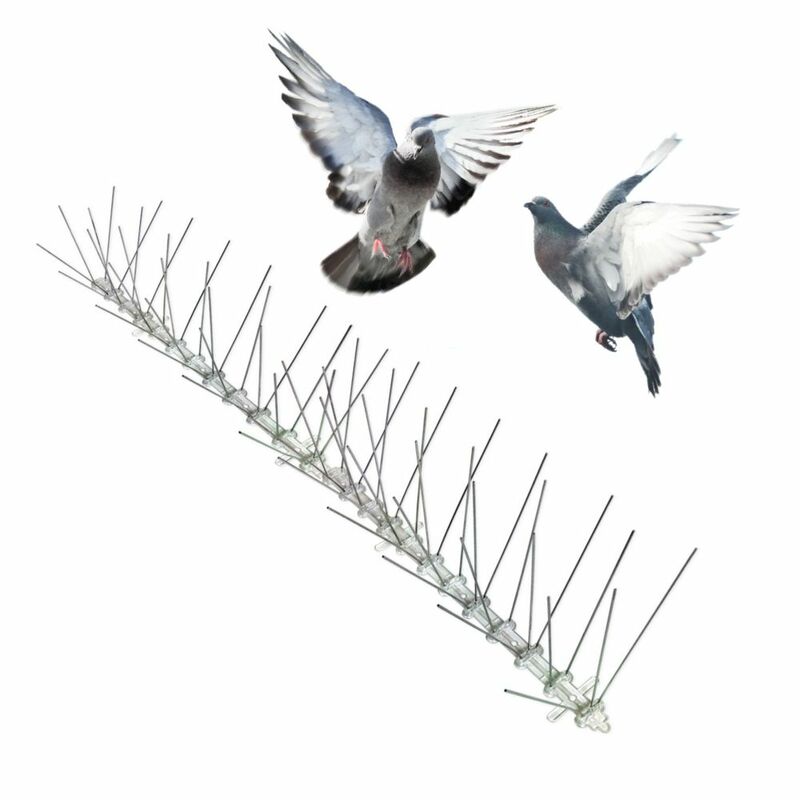 Stainless Bird Spikes 50 Foot Kit Guaranteed Bird Repellent Control #1 Best Seller is rated 4.4 out of 5 by 23. Rated 5 out of 5 by TWolfF from As describe, installed perfectly. ... As describe, installed perfectly. Rated 5 out of 5 by Dandee from Easy to install I am extremely satisfied with these spikes...they were so easy to put up and we haven't had one pigeon mess on our balcony since. From the street looking up at the balcony you can't even see them..great product! Rated 5 out of 5 by dalian from Easy to install & works well Bought a month ago and no more bird deposits on the cottage deck. Easy to install and for the length of the spikes a lot less visible than expected so not an eye-sore. Rated 5 out of 5 by George from I glued the pieces to my roof tiles around my... I glued the pieces to my roof tiles around my solar panels to keep pigeons from making nest under the panels. It worked excellent and has eliminated my problems. Rated 3 out of 5 by EDDIE from don't work too well I install about 100 ft of the spike and hoping the pigeon won't came to my window .. But that is not the case, The bird came back and stand on top of the spike , some how they not afraid of it . What kind of bird is this? Did i have to shot them with a shot gun or what?